August 21, 2017  When part of a Chinese street cratered, one unfortunate scooter rider failed to notice. We're fortunate he emerged unscathed — and fortunate, too, that his strange plunge was caught on camera. 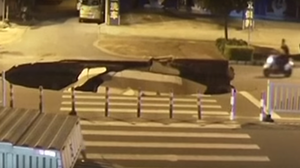 Did A 19th Century Brothel Tunnel Cause A Sinkhole In Dublin? 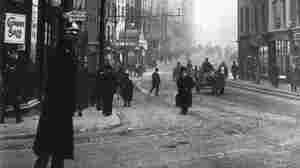 April 3, 2015  An Irish historian says, "There are tunnels under here going down Dame Street, which are linked to the Bank of Ireland up the block, which was formerly the House of Commons and the House of Lords." 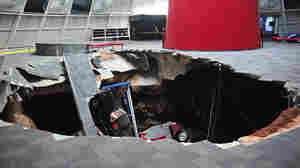 August 31, 2014  When a gaping hole opened up under a clutch of classic cars at the National Corvette Museum in Kentucky, the disaster became a favorite exhibit. But the museum's board has decided to fix it, anyway. March 26, 2014  Winter weather that doesn't seem to want to end has done its damage to roads across much of the nation. 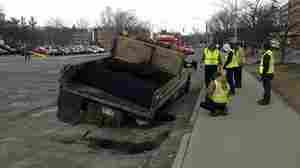 In Michigan, one road-repair crew saw its truck sink into one tough pothole. February 13, 2014  Surveillance footage shows the floor opening up beneath some of the iconic cars at the National Corvette Museum in Bowling Green, Ky. Other videos, taken with cameras mounted on a small helicopter, show what it's like down in the pit. February 12, 2014  No one was injured when the hole opened up before dawn on Wednesday. 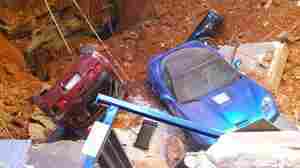 But fans of the iconic car will be sad to learn that eight special models fell into a pit that's about 30 feet deep. August 12, 2013  Vacationers staying in central Florida awoke to crashing sounds Sunday night, as their three-story building began to collapse. A large portion of the structure at a resort in Clermont was pulled into a sinkhole. It seems the process was slow enough that everyone in the building got out safely. July 4, 2013  It was quite a surprise Wednesday for Pamela Knox of Toledo when her car dropped beneath a street. Check out the scene. Can We Ever Explain Human Tragedy? March 4, 2013  When a sinkhole swallows a man whole, it's natural to look for answers that explain the tragedy. Can science provide the answers? Commentator Tania Lombrozo says that some explanations are never satisfying. 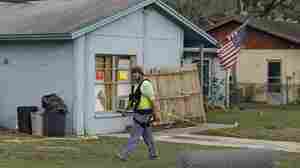 March 2, 2013  Rescuers are back at work outside a central Fla. home, testing the edges of the sinkhole to see if they can get close enough to search for Jeff Bush. He fell inside late Thursday night and is feared dead. 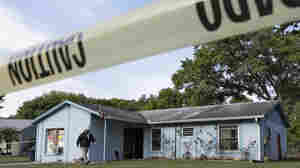 March 1, 2013  The hole opened up under a home's bedroom in Tampa. Two men, brothers, were in the house. 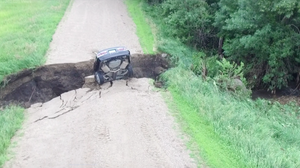 One tried to save the other, but wasn't able to keep him from being dragged down into the now 100-foot wide hole. It's feared that the man is dead.